Grand Prix SnapShot – our photographic review of the grand prix weekend. Canada gave us yet another great race and here are our favourite images from the weekend, enjoy! All smiles on Saturday – Lewis and Nico were ridiculously close in qualifying, giving Mercedes another front row lock out. 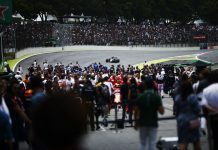 The start – Nico was pissed off, not only did Sebastian Vettel make a tremendous start and pass the silver cars, Nico was left with nowhere to go as Hamilton defended P2 behind the Ferrari. 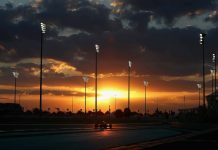 Williams had a far better weekend, with Bottas giving them a much needed podium after a one-stop strategy, the same that won the race for Hamilton. Massa on the other hand waved goodbye to another chance to shine, engine trouble saw him retire. Ferrari were frustrated but Vettel was still smiling with a podium finish and a solid race. Raikkonen on the other hand spent the race moaning and was made to look slow all weekend. Kvyat’s tricky year isn’t getting much better, beaten by his team mate, plenty of errors and this expression sums it all up. He has to hope for a change of fortune going forward. Carlos Sainz made a great recovery and had the measure of Kvyat all weekend, even brought home some points after a tricky qualifying. Jenson Button had a tricky weekend, out qualified by Fernando Alonso, retired on Sunday – but he was in good spirits ahead of the race weekend, dancing about. Let’s just hope 2016 isn’t his final waltz. And finally, those seagulls – happily mucking about on track as Sebastian Vettel came speeding past, it made for some great TV with Seb and Lewis having a laugh post race with Simon Lazenby. Fantasy GP 2014 is here!